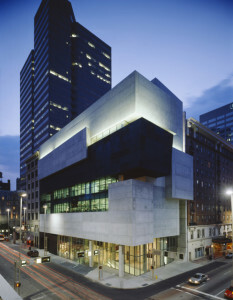 It’s been almost 13 years since luck brought me back to my Cincinnati hometown the exact weekend that Zaha Hadid’s new Contemporary Arts Center (or for those who are sticklers for naming rights, the Rosenthal Center) opened. In a downtown poised to transition from near dilapidation, Hadid’s striking building was a harbinger of what the area would eventually become: a neighborhood bustling with fine restaurants, scenesters and a homeless population that reminded me of my current Manhattan home. The opening party I attended distracted slightly from my initial impression, but a visit last summer confirmed that, if anything, Hadid’s museum was not only too good to be true, but too good for a town now boasting work by Frank Gehry, Michael Graves, Peter Eisenman, Bernard Tschumi and Thom Mayne. I shuddered when, on a tour around town, my sister expressed her disdain for one of the Gehrys nestled on the edge of the University of Cincinnati’s campus. Surely this wasn’t the collective assessment of the riches any smart city would kill for. I bit my tongue (and repressed the urge to wring her neck)—maybe it’s hard to appreciate buildings that don’t hew to tradition (change is a mother), or a middle-American’s notion of how they’re supposed to work. On my second visit it occurred to me that Hadid’s remarkable museum might also repel, judging from how sparsely populated it was with patrons. Fine by me: absent of folks, what a lovely opportunity it was to savor those sharply eschewed staircases and cantilevered rooms, and admire the improbable curvilinear space she wrings from such sharpness. The result is the kind of shape-shifting disorientation that topples the mind; viewers let themselves go, the better to embrace the restless imaginings wrought by today’s artists. Hers was a new way to dream. I haven’t seen nearly as much of her work as I’d like but the possibility of pilgrimages to cities where they live makes me want to jump on a plane. The critic Herbert Muschamp called this, her first American building, “the most important American building to be completed since the end of the cold war.” After walking its halls, such a declaration warrants an ‘AMEN’ but makes me mourn her remarkable ideas that won’t live because Hadid’s no longer of this earth. The loss is ours.